From a chain or a high-end Italian eatery, we just can’t get enough of this flat (sometimes), round (sometimes), oven-baked bread covered in toppings ranging from the traditional (tomatoes, cheeses and herbs ) to absurd (pineapple, cottage cheese and fish roe). Deep dish, thin or think crust. Neopolitan, Sicilian or Lazio. Caruso, Cibo or Shakey’s. It really doesn’t matter when or where from. We just love our pizza. So here is the question. When you want a pizza, who do you call, where do you go and what do you order? I love Shakey’s Pepperoni crunch on a thin crust (if I wanted a thick crust, I would order a sandwich!). With extra crunch, please! I’ve only tried it once, but I also think the Milan Pizza at California Pizza Kitchen is delicious. Thin crust with Italian sausage, wild mushrooms, caramelized onions, Fontina, Mozzarella, and Parmesan cheese, and fresh basil. For a chain restaurant, I like Brooklyn Pizza and for a stand alone, Puccini. I always order a four or five cheese or whatever’s closest to it. Except at Shakey’s where I order the garlic and cheese. I’d have to go with Yellow Cab and Cantinetta. At Yellow Cab, I like the everything on it. But usually, I just order the four cheese with extra cheese and anchovies. And yes, I can finish one pizza, and two cans of coke in one sitting. At Cantinetta, I like four cheese. So, it’s basically the same order. Carruso along Reposo Street (aka. Nicanor Garcia) is good. They have a wood fire oven and its run by an Italian. I always find a freshly made pie from Brooklyn Pizza great. Brooklyn Pizza for huge, NY style Pizzas. And with a variant named “Porko”, c’mon! How can I resist? I still like A Venetto for cheap pizzas. They aren’t the best out there, but they’ve been consistent in terms of providing value for money. I love California Pizza Kitchen. My favorites are the White Pizza–a five cheese pizza (made with Mozzarella, Fontina, Ricotta, Parmesan and Pecorino Romano cheeses) with sauteed spinach and applewood smoked bacon, and the Vegetarian Pizza with Japanese Eggplant. I always get them in honey wheat dough just to make me less guilty about the calories. As for restaurants, I always go to Cafe Caruso in Reposo, Makati for their four-flavors-in-one pizza (have to check what it is called exactly). I make sure to include the Quattro Formaggi and Prosciutto with Mushrooms in my choices. I judge a pizza by it’s crust (this is really 50% of a pizza), it’s gotta be good enough to eat on its own, and the freshness or quality (and not quantity) of it’s ingredients. I’m not much of a ‘everything-on-it’ kinda gal. Having said that, I do have my favorites in the city. In the chain pizza category , well that’s a tough one, I have 3 favorites (Magoo’s Joey’s Special, Yellow Cab’s Roasted Garlic and Shrimp & Brooklyn Pizza’s White Pizza) and I love them equally. But if I were forced to choose just one then I’d go with Brooklyn Pizza’s white pizza. It has no tomato sauce, just good quality cheeses which I believe are mozzarella, ricotta and parmesan. The crust is crisp yet chewy and.. ohhhh the cheese! It’s truly heaven on a pie for cheese lovers like me. If you haven’t already tried it, please don’t take my word for it and go have some now! Pizza from a stand alone restaurant, hmmm. Do panizzas count? Because I am absolutely smitten with the Panizzas of C’ Italian Dining in Angeles City. The panizza is Chef Chris’ own unique creation. It’s basically a thin-crusted rectangular pizza with choice toppings (there are about a dozen combinations) sliced into strips. You take a strip, top it with arugula and alfalfa sprouts, drizzle with pesto (or not, your choice) then roll it up, and prepare to be blown away! I love Magoos' Vegetarian Pizza. Nice list! Our current favorite pizza place is Brooklyn. Hi Sakai! Where exactly is Chi's Brick Oven Kitchen in BF? Thanks! Where do you think Brooklyn got the idea for their White Pizza? Their owner used to frequent Festival Mall and pirated workers there. What a beautiful pizza that is in the photo! The first time I tried Cibo's pizza, I enjoyed it a lot. But the next time I did, it was undercooked and soggy. I hope that was just on off day. I also like the Pinoy Pizza trend -- kesong puti, tuyo, longganisang Lucban, red egg, etc. Cascada has a good one, as I recall. Katrina, I love Amo Roma's pizza too, and if the Alabang branch hadn't been moved to Tagaytay, that's what I would have offered up instead of the panizza. I want to try that truffle pizza of Cafe Ysabel now! I miss Magoo's Pizza. They have really fallen off the radar. As much as I love the traditional pizza myself, I sometimes like tucking into new creations pizza joints place on their menus. But never fruit, especially pineapple. Try the Pizza at Lime 88. Think you might find it interesting. yup franco- taste of LA, try the spinach bacon pizza or the lamb pizza, will post abt it within the week or two. the husband: Chi's brick oven kitchen is in Aguirre street inside BF homes. check out my post for pictures and prices. This is a nice blog.. The site txtmate.comoffers free sms in the Philippines. Pizza! Yum! Yum! Don't forget Bravo's pizzas!!! I forget my favorite variant, but it keeps true to its promise on the menu of melting in the mouth. Just want to say thanks again for helping out with this post. Nice to hear from you. :) I haven't been to Bravo. What do you order? Im a thin crust fan, can't do the thick crust unless it's clearly a Chicago deep dish pizza (which means being stuck in wintery windy city in need of sustenance). Locally, my go to pizza is the cheese and garlic thin crust of Shakey's, but I love the four cheese of Yellow Cab, the white pizza at Brooklyn, and Amici. I guess I'm a cheesehead when it comes to pizzas. No pineapple please! 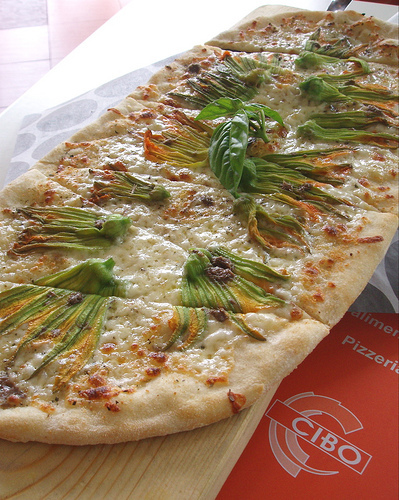 Among the Cibo pizzas I've tried the one you photographed, and also the one with chicharon! Yes, I know that a "white" pizza is not new. What is interesting is the ingredient that they are using to make it white. Very few restaurants (especially fast food restos) will actually use ricotta because of its price. It's the replacement ingredient that's important. They were only able to get that by pirating people. I'm only getting annoyed because they get credited for a stolen recipe. The best Pizza I've tried would be that of Amoroma's! They're so malasa! Next would be the Cesar Salad Pizza of Al Dente! As for the fast food pizza I'd go for Brooklyn Pizza! Kinda sawa with Yellow Cab already. I love thin crusted pizzas!! Gosh my ultimate go-to pizza has got to be the garlic and cheese thin crust of Shakey's. I agree with some of the comments here. I like the pizzas at Bravo, they're quite good especially the one with Italian sausage. The Brooklyn white pizza is good but can be oily. Hi candishh. A cesar salad pizza? Sounds interesting. Hi bong. Keep looking. :) But really when it comes to pizza, who can anyone have just one favorite? Hi issh. Planning to try Bravo soon. I do strong recommend trying Caruso as soon as possible. Hi u8mypinkcookies. I have eaten at Aria. And I agree. Having a delicious pizza facing a beautiful beach is hard to beat. yup, lime 88 streetstyle pizza is really good! Funny how I've never tried Brooklyn Pizza, being a self-proclaimed pizza lover. I do love Shakey's thin crust and Yellow Cab for those late-night cravings, but the best pizzas in the city so far would be Caruso's pizzas (in Metro Manila, at least). One thing I had recently which I haven't tasted in a really long time is the Gorgonzola Pizza at Il Ponticello. I forgot how good it is! Trio at the fort is the place to be. Paparazzi no longer serves pizza. Bravo has been in decline in terms of its pizza consistency/quality. Pazzo tastes dry/terrible and so does Cibo. Shakey's is the next best thin crust pizza, though you have to dine in for it to taste great, delivery just kills the pizza quality. Domino's with lots of extra tomato sauce is the best! hello guys thank you for all the list you've shared here. my friends and I tried all of the list here but nothing compared to AMOROMA PIZZA in tagaytay. cooked in wooden brick oven...DELICIOUSLY PERFECT! you should try it. highly suggested pizza 5-cheese & pizza prosciutto. if you cannot choose any, they have a small sized 5 topping pizza that you can try 5 different toppings. would you believe the owner it self with her sister is the one preparing it in front of you. we are all amazed with them. staff are very accommodating and all food are so good you'll never regret driving all the way in tagaytay, you'll be satisfied. Pizza Express was the best but it's not around anymore. The best American-style pizza can be found at Italian Job Pizzeria on Timog Avenue. It's better than those of Italianni's, Pizza Hut, Shakey's, or Sbarro. It's also better than those of restaurants that have closed down their Manila branches, such as: Domino's, Little Caesars, Numero Uno, Pizza Inn, Round Table Pizza, and Volare. The best pizzerie in Metro Manila not yet mentioned here are: Aria, Cantinetta, Stella Wood-fired Bistro, Pagliacci, and Dolce Vita. Motorino, Bianca's Cafe and Vinotek, L'Incontro, Trattoria Poggio Antico, Pastelleria La Nuova, Bellini's. US-style: Steveston, Bigoli (this used to be Fazoli), El Buono, 5th Avenue Pizza Company, Sicilian Pizza, NYPD, The Sicilian Express.